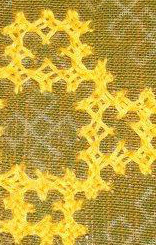 This week’s stitch on the new TAST challenge is top knotted buttonhole stitch. The link to the details of the samples worked earlier was posted yesterday on FB page. I started a bit late on SSS challenge started by Queenie. The samples of the first two stitches of the challenge were worked during this week. The third stitch is cross stitch. Since, there is a weekly cross stitch challenge, I might skip working it on this challenge. The workings of the stitches and other related details are available on Queenie’s blog. Though the orange and violet combo tunic is kept aside for the time being, there is another kutchwork project, which was started this week. The embroidery on brown silk was completed and ready to go to the tailor. The motifs worked inside the filling pattern are extended further this week. Some bead work needs to be done on the zari border. This week was quite interesting mainly due to the SSS challenge. There is definitely some fulfillment in learning and exploring embroidery stitches. Two more embroidery projects are waiting to be designed this week. The weekly stitch along RPW 2016 chart was completed on Sunday. The week’s TAST challenge is chained bar. I had worked the samples on a paisley design during the earlier challenge. 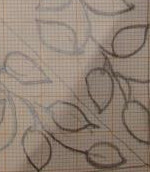 This is a new stitch challenge or stitch exploration on Queenie’s blog. This is a wonderful chance to try some new stitches. Visit her blog to see the details. I started with the first stitch sampler. the details will be posted on this category. This Marash embroidery project was completed during this week. Picture taken when working on the second sleeve. The orange and violet combo tunic will wait, while I deal with other tunic which needs to be given to the tailor for sewing. I am also excited to work the SSS challenge. 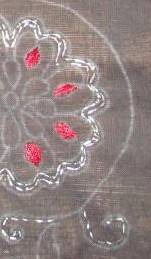 The markings were made by the tailor on brown silk fabric. The embroidery was started and it is progressing well. I should be able to complete it within a day or two. These fabrics are for another tunic. An idea of integrating kutchwork design and ikat design has popped up in mind. 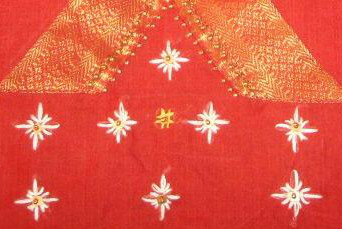 The design and embroidery will be kutchwork, the choice of colours will bring in the ikat factor. 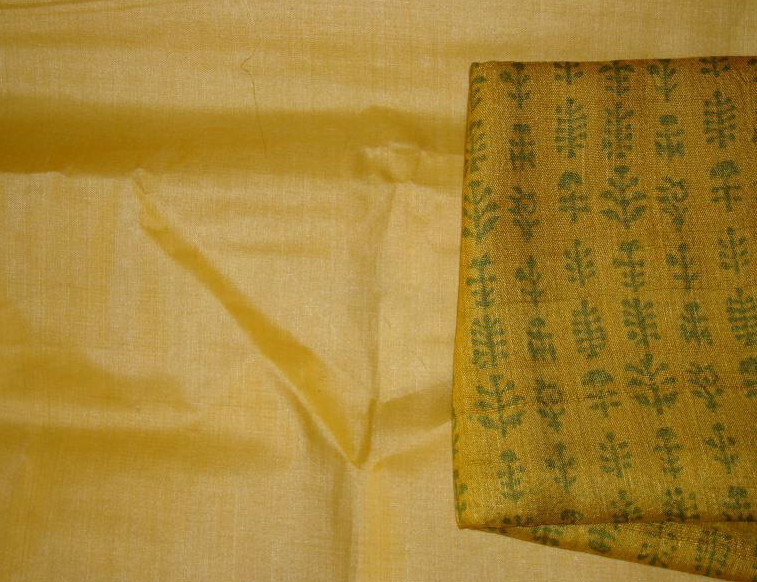 A slim border is designed, traced on green cloth is waiting for the work to be completed on brown silk tunic. Promises to be an interesting week.